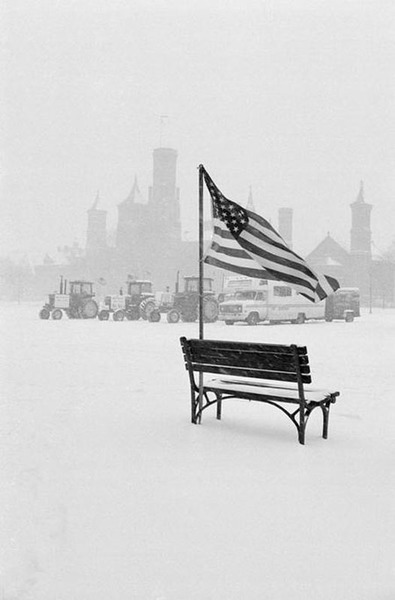 “Presidents' Day snowstorm of 1979,” Histories of the National Mall, accessed April 23, 2019, http://mallhistory.org/items/show/200. On Presidents' Day 1979 a 22-inch blizzard shut down Washington, DC. Forecasters had predicted that the storm would bypass the city, so residents and city planners were taken by surprise. For the first time in fifty years, the Smithsonian museums were closed for two days in a row. Farmers in town to protest agricultural policy as part of a movement called "Tractorcade" used their tractors to help clear streets and get emergency personnel to hospitals. Smithsonian Institution Archive. View original.